This past Thursday, Arayot went down to Boston in the morning to an elderly care facility known as the CFL to perform their Ketsev (rhythm)! The chanichim were already well prepared and performed all their songs and dances wonderfully. Of course, those who attended cheered and applauded. The performance included a flash mob, a boys’ only dance, a girls’ only dance, and a rendition of Matsiyahu’s “One Day” before the whole aydah sang together in conclusion. After the chanichim performed for the guests at the retirement facility, they were treated to some light snacks and beverages while they chatted it up with the residents and guests to further give back to the community in the spirit of their chesed (kindness) project. 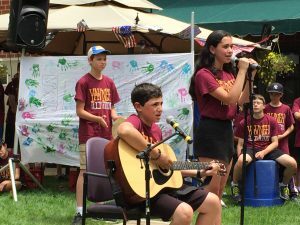 Following along with the theme of the summer, “kol Yisrael arayvim zeh b’zeh” (all of Israel is responsible for one another), Arayot took it upon themselves to bring joy to a part of the Jewish community that they didn’t know to show the importance of giving kindness and love to every person they meet. After thoroughly entertaining their guests, Arayot rode down to Dedham to catch a break at Launch, a trampoline-enthusiasts’ paradise. There, the chanichim participated in numerous games involving bouncing. Some were able to dunk on 13 foot hoops, and other played dodgeball or exercised some amazing floor routines. After jumping their way through the day, the chanchim were met by Yavneh’s rosh machaneh (camp director) Debbie Sussman and many other guests at Newton Center Park with pizza! Re-energized (as if they ever run out! ), the chanichim ran right into the raving rows of riveted relatives and restored some ruach (spirit) with their radiance and rambunctiousness. 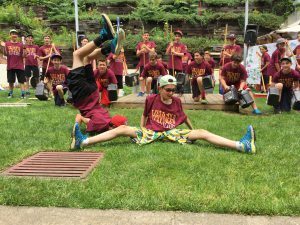 The chanichim produced another amazing show for the visitors before returning back to camp! 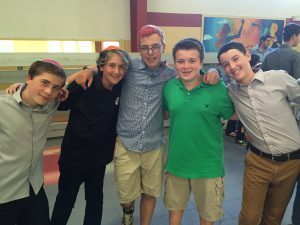 The following day, Arayot helped celebrate Noam H.’s belated birthday with an ice cream party before welcoming in Shabbat for the 3rd time this session. A nice and relaxing day was needed for this hardworking aydah. 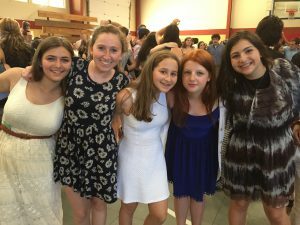 Nevertheless, once havdalah came and Shabbat went, Arayot was up to their old tricks and new dance moves, as the camp enjoyed another rendition of the girls’ dance! You can watch it on the Camp Yavneh website (www.campyavneh.org/streaming), because we live streamed it last Saturday night. This week, Arayot will come together once more on Thursday to take on the battle that is Zimriyiah, the camp’s singing competition that features 3 songs from each aydah and concludes with smiles and ice cream! We hope to see you at Zimriyah on Thursday, but if you can’t make it, you can watch us online when Yavneh, once again, streams the event!